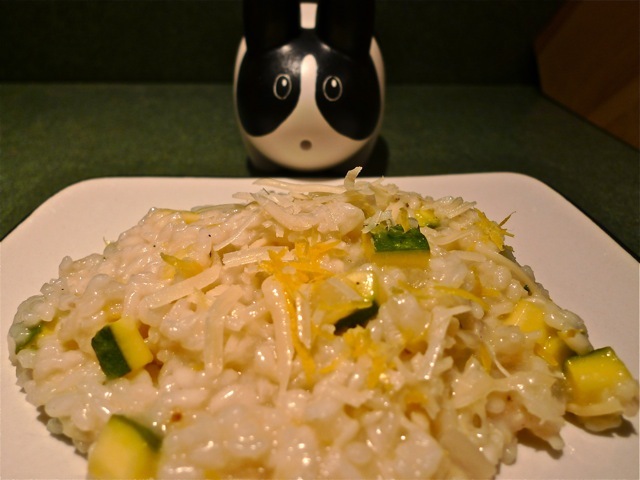 When the labbits' friend Teresa isn't touring around North America on her BMW 650GS, storm chasing in the midwest or researching extreme weather in the Arctic, she takes time to share one of her favourite recipes: Lemon Zucchini Risotto. Even superheroes have to eat, after all! If you're a fan of risotto (and who isn't? It's like elegant mac n' cheese) be sure to check out the beet risotto from last week. Risotto, you'll learn, is a basic formula of oil, onion, arborio rice, and slowly stirring in hot broth. What you add to it is up to you. Print out the recipe here. Place the stock in a large saucepan, bring to a boil, then reduce heat, cover, and keep at a low simmer. Heat the oil in a large sauce pan, add the onion and cook over medium heat for 5 minutes, or until softened. Reduce the heat, stir in the rice and cook for 1 minute, stirring constantly. Add 1/2 cup of hot stock stirring until all the stock is absorbed. Continue adding stock, 1/2 cup at a time, stirring constantly, for 20 minutes, or until all the liquid is absorbed. If the risotto gets too dry, add a little extra stock or water. Stir in the sherry, lemon zest, lemon juice and zucchini. Cook over low head for a further 5 minutes, or until the risotto is tender, with a slight bite to the inside of the grain. Season with salt and freshly ground black pepper, and stir in the parsley and half the parmesan. Garnish with lemon zest and remaining parmesan.